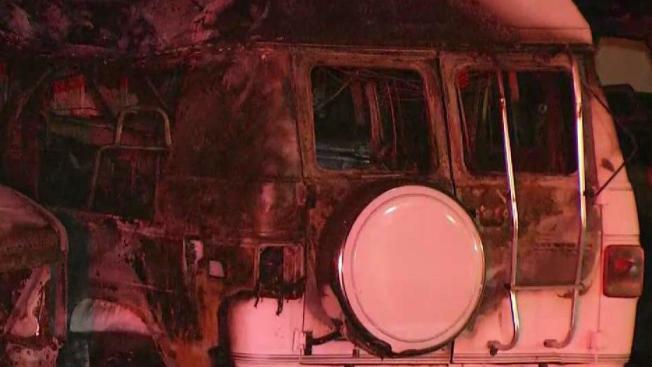 A fire in Newark on Wednesday scorched multiple cars and harmed the outside of a commercial building, according to the Alameda County Fire Department. Kris Sanchez reports. A fire in Newark on Wednesday scorched multiple cars and harmed the outside of a commercial building, according to the Alameda County Fire Department. Firefighters were alerted about the blaze, which ignited outside of a building at 5511 Central Ave., just before 2:15 a.m., fire officials said. The blaze was knocked down in roughly 15 minutes. A row of cars parked outside of the building were actively involved in the fire, according to fire officials. The outside of the business was also damaged, but it doesn't appear that the fire spread inside. No one was inside the building at the time of the fire, and no injuries were reported, according to fire officials. It is not clear at this time what sparked the blaze. An investigation is ongoing.